Home›Landlording and Rental Properties›How Do Heating Systems Impact Home Values? I am definitely not an expert in the area of heating and cooling a home. But I can appreciate the cost savings of a high efficiency furnace just as much as I can be turned off by the expense of baseboard heating if I am going to be paying the heating and cooling costs in a rental property. We just purchased a gorgeous 4 bedroom, 3 bathroom home with ocean views from the large wrap around deck, the kitchen, dining room and living room. The bedrooms are good sizes and there is even an additional living room or playroom for kids and a nice sized laundry room. There’s plenty of storage space both in the laundry room, furnace room and in an additional storage room built off the garage. With less than $5,000 in landscaping, paint, fence repairs and appliances the home was easily worth at least $15,000 more than we paid for it. For a home of this quality in the premium location we purchased it in, that is a great purchase. The day we closed on the property a home 2 doors down came on the market. It was listed for $5,000 less than we paid for the first home and it’s the identical home. They were both built by the same builder about 30 years ago. Obviously I rushed over to check out that home as I figured it was going to sell fast at that price. The reason this home was priced so well is that the basement is only partly finished. After taking my carpenter through the house and running the numbers on what it would cost to finish the other home the same way as the place we just bought, the neighbouring house would basically be worth the exact price of the home we just bought. There are a few minor differences between the two homes but in general, assuming you finished the basement up pretty much the same, there is one only one main difference between the two homes. The home we purchased has a 2 year old heat pump installed. The other home has a forced air furnace that runs on natural gas. There are many different kinds of heating systems used in heating homes. You’ll find that the systems are classified in a few different ways. The first way is by the type of fuel they use and the second way is the way in which they actually get the heat out into the home. The fuel sources I’m aware of include oil, natural gas, electricity and even solar power. The heat generated by these fuel sources can be distributed by air, electric wiring or sometimes water. Each has its own advantages and disadvantages which typically come down to installation costs, maintenance requirements and ongoing usage costs. But … I’m still working on this … and plan to dig deeper into recent sales to see what I can figure out. In the meantime it sure has been nice working in the home with the heat pump – there’s nothing like air conditioning in a home when it’s smoking hot out doors! Interesting topic. I am currently trying to purchase a short sale home to occupy that has a heat pump that is over 50 years old. Many last 100 years. To me that is a big value, but I am not your average buyer. On a side note, an inspector gave me a great tip on furnaces. If keeping the same furnace, clean it very well inside and out. Blow out any and all dust and wipe it down. The next inspector will see a clean furnace that looks well maintained. Its a very cheap way to give the inspector a positive impression of the home. They may not be buying, but their report can certainly influence the buyer. I think you are confused, a heat pump will in no way last 50-100 years. Now a properly sized and installed heating boiler with radiators will last an easy 50 years, and could also last 100 years. I am speaking as an HVAC professional in business for 30 years. My own home was built in 1924 when I bought the property in 1986 it contained an oil fired boiler from 1924. The boiler was still working but very inefficient, it was changed out with a gas fired boiler that is today still heating the house. A properly installed heat pump which is really just a cooling system with a valve that reverse the flow of refrigerant in the coils. In this way the coil that is outside and throwing off heat is via piping switched to the inside and the cooling coil is switched to the outside. In practice the refrigerant is in both modes absorbing heat, in the summer inside the structure conveying the heat to outside and in winter the refrigerant is absorbing heat from outside and conveying it to the inside. In some colder climates the amount of usable heat drops to a point where back up heat must be called into play. This back up heat is for the most part electrical resistance heaters, but in some cases gas or oil furnaces are used for this purpose. Heat pumps have a usable life span of 10-25 years as the maximum. Hot water heating has the longest life cycle, I have a church customer that has a boiler from 1880 it was originally coal, and now is oil fired. I’m with you Jason – things I place a lot of value on after years and years of investing are not the same things that tenants or future purchasers place value on. I don’t think I will find a perfect answer to this but I wanted to write about it since I thought it would be an interesting topic for discussion. What a FANTASTIC tip you’re sharing about the furnace clean up before an inspection. You are right about the inspector’s score card playing a role in how future buyers view your home. Thanks for that. Personally I would pay more money for an efficiency furnace or a new heat pump. But I also think I would probably pay a slight premium for a new roof just because I don’t have to deal with getting it done. Interesting topic! I have many years of experience in the Heating and cooling business. I can tell you for certain that in most parts of Canada a heat pump will not attract buyers or tenants. I have a couple of buildings that have central air and it seems that the tenants really like that and are willing to pay a small premium for it. 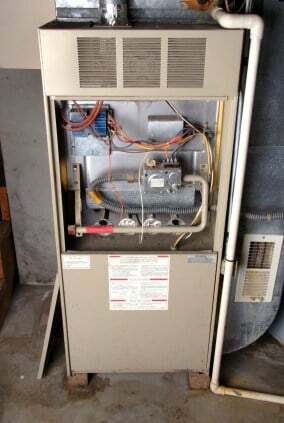 A well maintained furnace and central air is a must, I have seen some equipment that looks and rums like new after 20 years while some equipment we had to replace after 10-12 years due to lack of maintenance. A new furnace or air may not bring you more money but it will certainly attract more buyers or tenants, giving you a bigger audience. I’d be happy to answer. Thank you so much for that insight. That is just the sort of information I was looking for when I wrote this post. And what I have found is exactly what you are saying. Your audience is larger but that audience doesn’t put a price premium on the home just because of the heat pump. Thanks so much for taking the time to share your expertise. What market in Canada are you in? I’m thinking timing will have some impact on whether it will be seen as a premium by your buyers or tenants. If the usefulness is immediate and tangible, that value will not be lost on them.